The ocean fishing for salmon is a wrap for 2015. I would have to say it was a very good year but at the same time it was a very interesting one with many challenges. Tuna fishing is still going but with most being found in excess of 50 miles; that, too, is soon to be ending. There are some bottom fishing trips ongoing but that will soon end due to sea conditions. As much as we hate it, all good things must come to an end. Now we find time to regroup, clean and repair gear, do boat maintenance, hunt, and enjoy family. 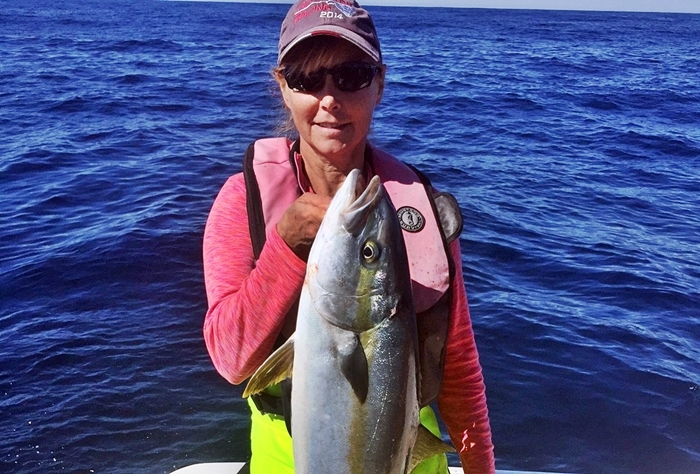 Our 2015 season ended with a bang and we had a rare catch of four Yellowtail Amberjack during our last Tuna trip. Mainly found of the coast of California, they do venture off our shore occasionally during the summer Tuna season. Carrie Cruz is holding her fish from the day. 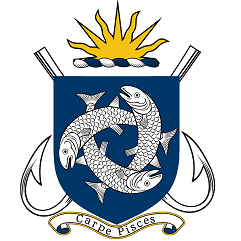 Fishing opportunities still are available around Westport. 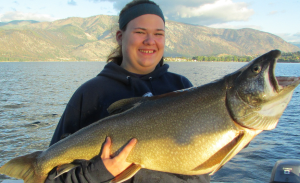 The Boat Basin salmon derby is ongoing and it is free to participate in. A few nice Coho are being landed and there are a lot of Jack Salmon mixed in. The Bay or Johns River fishery is in full swing. This is a tide bite fishery with most fish being caught are coming on the flood tide. Use Divers or Dropper weights with a inline flasher, spoon or bait. Troll the edges for the best result. Stop by our store near float 12 for gear and the latest updates. I will recap the season next week and hopefully we will have word on Razor Clam digs soon. As always Have Fun, Be Safe, and we will see you in Westport! The results of Westport’s annual Salmon Tales festival‘s smoked salmon competition are in! On September 24, seven pro smokers vied for the title of the Best Smoked Salmon in the Pacific Northwest. Steve Shindle returned to take both the Pro judged and the People’s Choice Awards. This makes three out of four wins in the last four Salmon Tales’ for the judged prize and two of four for People’s Choice for the Buckley, Wash. smoker. Check-out all the winners here. 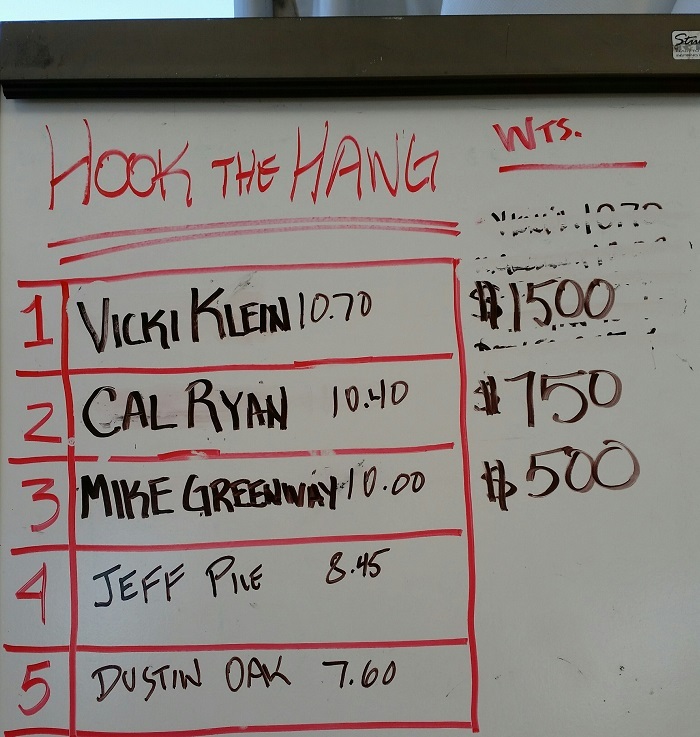 This past weekend the third annual “Hook the Hawg” derby took place out at Roche Harbor. The fishing wasn’t red hot, but we did manage to win with a 10.70lb Coho. This is a fun little local derby, put on during a great time of year. Beautiful crisp fall weather, with some different salmon to fish on. Thanks to everyone who helped put it on. Good times! Fishing for Coho has slowed down in the past few days. The Coho being caught are in the 4 to 6 lb range. However, if the forecast for rain holds up – look out! Big Coho should be on the way. One day it’s hot – next day it’s not. This weekend and most of the next week looks as if it will finally rain. If so, all the Coho holding from Port Angeles out to Sekiu will come in quickly. So, be out there with your favorite Silver Horde spoon. The size of the Coho should go up dramatically. “Hey Jude” did not let us down when she kept the boat in the slip and started throwing metal from the shore. “It was easy pickin’s of some hefty fish !” she noted with a wink. “THEY ARE GETTING BIGGER !”…and fresh fish continue to arrive daily it seems in Area 9. I have never seen so much bait stacking up on Possession Bar stuffing the Silver sliders. The herring is large so we have moved up to big white hootchies stuffed with a purple UV Ace Hi. I think we are in for another 3-4 weeks of Coho action so do not put the net away just yet. Kathy with another nice one on a beautiful October afternoon on the salt. You can’t catch em if your not fishin’ ! There continues to be Coho caught from the Redondo area, to the mouth of the Puyallup River East of the Marina and West of the Marina along the Gig Harbor shoreline from Pt. Fosdick North to Pt. Richmond, the bulk of the Coho are being caught real close to the shore. Crabbing reopened in the area and the crabbing has been fair with fishermen crabbing all over the place from Commencement Bay to Quartermaster Harbor to the Dash Point area. Basic Fishing for Youth Ages 8+ and a parent/guardian Saturday, October 17 from 10 am to 12 noon Point Defiance Marina Learn about basic freshwater and saltwater angling. Great way for a parent to learn along with their child about regulations, knots, tackle, bait, and techniques of fishing to better enjoy our lakes, rivers, and Puget Sound For more info genea@tacomaparks.com or 25-59-5325. 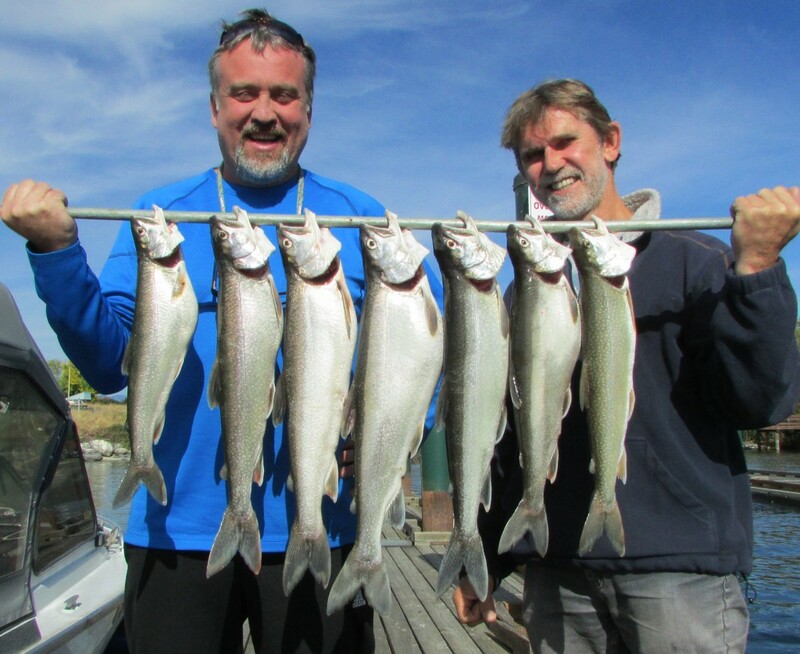 The Vastakas’ from Auburn with their morning catch of Lake Chelan Mackinaw. What continues hot is trolling the Barrens and the Trench for Mackinaw on Lake Chelan. The Bar, early in the morning can provide that big fish bonus. Heating up is fishing Mill Bay and other near shore areas for rainbow trout. We are looking for lakers from 165 to 205 feet deep early in the mornings. Later in the day, trolling tight to the bottom in depths of 210 to 250 feet works best. Make that first light pass over the Bar for your best shot at a “big”. Counter to conventional thought the later morning / mid-day bite has been the strongest. Fish within 3 to 5 feet of the bottom and keep your speed around 1.2 mph. Glow in the dark Smile Blades from Mack’s Lure continue to be the go to attractor here on Lake Chelan. Put those in front of a 3 to 4 inch squid rig, bait them with a piece of Northern Pikeminnow and scent everything with Pautzke’s Krill Juice to keep yourself consistently into the fish. Worden Lures Flatfish in U20 and T4 are very effective in the LUCH and GPLF color patterns. Also effective is Silver Horde’s Kingfisher Lite spoons. Kendra Opsata (13) of Bothell with a monster laker. She was fishing with her dad, Ken. Those Rainbow trout are averaging a chunky 15 inches. They can be caught from shoreline locations with Pautzke’s Firebait in American Wildfire using a 30” leader on a slip sinker rig. You can also catch them trolling using Mack’s Lure Mini Cha Cha Squidders behind a Mack’s Lure 0000 Double D Dodger. Your fishing tip of the week is to rinse grit out of your reels and lightly oil them if you are putting your gear to bed until spring. That will prevent those reels from “seizing up” when you go to use them again. The safety tip of the week is to go through your first aid kit to replace and / or replenish the items that need it. For us, that’s usually band aids and Ibuprofen. The beginning of fall can be a good time to fish for German Browns. While there aren’t many lakes this side of the Cascades where they are stocked, Martha Lake (near Lake Goodwin) is one of those lakes. Martha Lake provides limited access for fishing unless you care to fish at the rustic boat ramp, have a boat (no outboard motors) or live on the lake. Martha Lake has a nice tea stained color and has a deep drop off of over 70 feet at the end of the lake. Many fly fisherman visit this small lake and there has been talk of making it a selective gear fishery. The lake gets stocked yearly with German Brown Trout and Rainbow Trout. 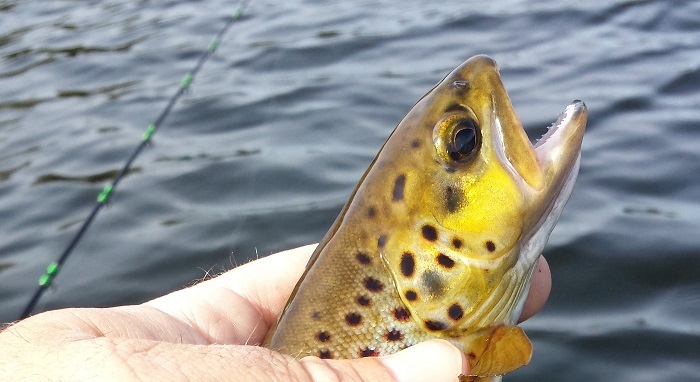 The stories of those bigger browns that have survived years in the lake keep me coming back. While fish can be taken on the surface trolling wedding rings or small Needlefish spoons, I prefer to troll a little deeper using lead core line 15 to 20 feet down – trying to find drop offs where fish are laying on the bottom. Small Rapalas, spoons or spinners all work. The fish aren’t huge but full of color. While I only picked up one fish today, it went back to see another day. If the trout bite isn’t on, consider working the docks, fallen trees and lily pads for largemouth bass and crappie. A sure sign that fall is upon us as the temperatures are dropping and the water outflow from the Potholes has slowed down. This means we will be seeing the lake starting to fill up again. This will provide access to more areas to fish as well as opening more area for the duck hunting season starting soon. The primary boat launch on the east end of the dam even yesterday looked like a mid summer launch with at least 25 boat trailers parked. This is for one reason with mild weather and no wind and that is just how good the Walleye fishing remains. Most are still fishing just off the sand dunes and many are culling to pick just which 8 to keep as their limit. 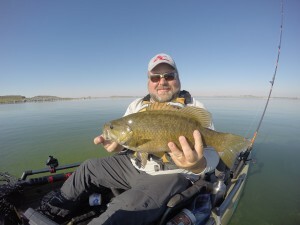 Increasing bassers are fishing the face of the dam for good smallmouth fishing. Access to more lakes below Potholes by the opening the road that had been closed because of fire danger from the north end of the road to Long and other lakes. Fishing at the Potholes Reservoir the past couple of weeks has been hot and cold. What’s amazing is the consistency the walleye fishing has been this year. I’ve been over a couple of times the past two weeks working all parts of the lake from my Hobie pedal driven kayak. 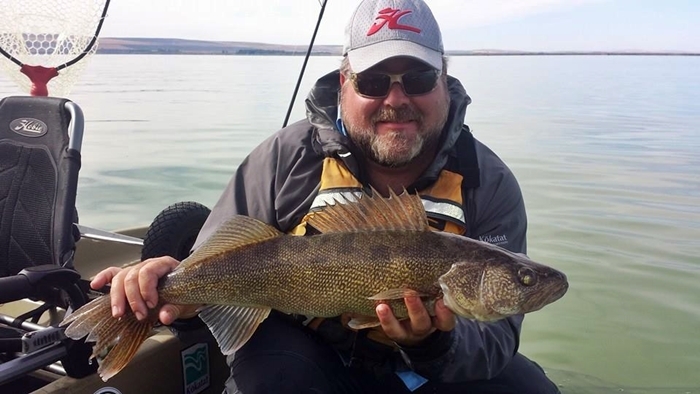 There never seems to be a shortage of walleye along the rocky parts of the dam – especially near Mardon Resort. I landed several 15 to 20 inch walleye just pulling a worm harness / spinner combo and a 2oz bottom walker. I’d pick up a few smallmouth and the occasional bluegill and bullhead in the mix. The drawback – you may get snagged up on bottom. The payoff is that there are bigger fish in there if you can move through the smaller ones. The island just off the dam also proved to hold a few fish. I picked up a 4.5 lb smallmouth while dragging for walleye in about 12 feet of water. What a fight these beautiful fish and with the lake being covered with green algae from the warm temperatures we’ve been getting, it’s a surprise until you get the fish above the water level. For a longer troll along Medicare Beach I switched over to lead core line and a diving crank bait. This set up got me near the bottom in about 27 feet of water. It was a long troll down to the dunes but when I saw my Kokanee rod bend in half, I knew I had a nice fish on. I landed a beautiful 29″ walleye that I released in shore. My buddy and I made our way to what locals refer to as “Whale Bones”. There’s some nice pinnacles mixed in with drop offs. Fish could be found within 6 to 25 feet of water. I switched back to a bottom walker/worm harness set up and my light weight bass rod buckled over and started peeling drag. I was thinking this was a big bass but this was no bass. My personal best – a 33 inch walleye. What a day! Salmon fishing was FAIR in East Sooke. The Head was the most productive location over the week. The best fishing there has been 200 feet of water and deeper and between 40 – 90 feet on the downrigger. There was a few springs caught ranging from 9 to 20 lbs in size. More hatchery coho are showing up. G-force spoons were the most productive lure. However, plastic baits have been popular as well. The Glow/Green Stripe hootchy has been effective for springs this past week. Spoons, such as the G-Force and Skinny G, in the Bon Chovy or Irish Cream colours were effective. For flashers, the Lemon Lime, Super Betsey and the Purple Onion have been good. Salmon fishing was SPOTTY this past week. Most salmon were caught when fishing with lures right on the bottom (60-110 ft) on the Flats and by the Gap. The fish were hitting needlefish spoon and squirts. Anglers also caught fish jigging right on the bottom. G-force and Skinny G spoons in No Bananas and Outfitter colours worked just fine. Coho Killers in Gold Nugget and Green Splatterback have been pretty productive too. The best flasher has been the Gibbs Lemon Lime and the Bon Chovy. Again, Salmon fishing was FAIR this past week. A few Chinooks were caught at Church Rock and Whirl Bay but most anglers seem to be still targeting Coho out in the second tide line off Race Rocks. The coho have been ranging from 3-6 lbs, with a mixture of marked and unmarked fish that were being caught. Anchovy was the most productive bait when trolling for springs with Glow Green and Bloody Nose being top choices in teaser heads Spoons, such as the G-Force and Skinny G, in the Bon Chovy or Irish Cream colours were effective Flashers that remain popular include Super Betsey, Lemon-Lime and Purple Onion. Halibut fishing was FAIR this past week with reports of Halibut up to 57 lbs being brought in. Anglers that were fishing were using mackerel, extra large herring, salmon bellies and/or octopus for bait. Berkley Gulp and Powerbait soft plastics also work very well. You can also use a large spoon fished off a spreader bar, Mudraker or Lucky Jigs or other large Jigs if you want to stay away from the dogfish. 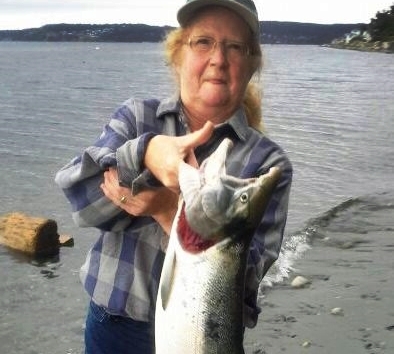 Salmon fishing was FAIR near Sidney. The salmon have been most abundant close to Pender Bluffs. Anglers report that mature springs have been slowing with springs being in the 9-15 lb range. They have been trolled between 90 – 130 feet on the downrigger. Coho are also in the area and we’ve heard of both wild and hatchery fish being caught. Coho have been holding around the 50 foot depths. Many anglers are fishing using anchovies in Bloody Nose and UV Green teaser heads. Squirts have been out-producing hootchies and the hot patterns for springs now are Orange/Black/White, Purple Haze and Electric Chair. Coho Killer spoons have also been working well, especially in double glow and Gold Nugget. The salmon fishing was FAIR this past week. There were a few springs being caught although the size is starting to go down to 6-15 lb range. There has been the odd exception of springs into the mid 20’s. Coho are being caught, usually out in the shipping lanes and in 300+ feet of water. The second tide line has been producing most of the fish. Few Chums have been caught. 3.5-4” G-Force spoons as well as Hoochies are the top choices for Sooke anglers. G-Force spoons in Outfitters, Irish Cream and No Bananas and Hoochies in White Glow, Army Truck and Tiger Prawn are the go to colours that have been catching their fair number of fish. The most popular flashers recently have been the Ok’i Betsey, the Gibbs Outfitter and the Madi. Fishing for springs was SPOTTY along the waterfront. 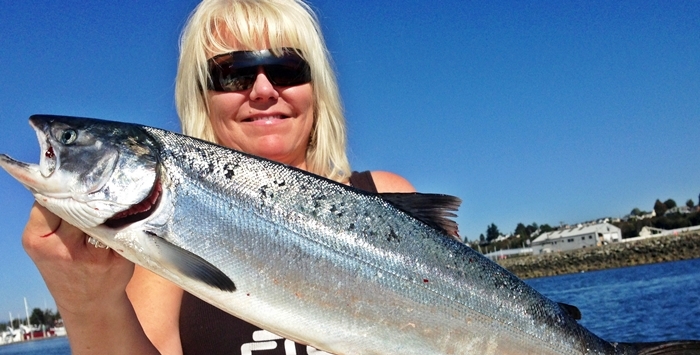 Most anglers switching there target fish to Coho. Anglers were finding success in 300 ft of water off Albert Head as well as off the eastern edge of Constance Bank. The coho are starting to show up in better numbers but still seem scattered along the Victoria Area. Anchovies, spoons and squirts were successful in getting hook ups. Chartreuse and Purple Haze have been the most popular colors for teaser heads. Good choices in plastic baits are the Electric Chair, Purple Haze and Glow white. Gibbs Coho Killers, AP Needlefish and Coyote spoons in green, moon glow and silver colours have been very effective. The Lemon Lime and Bon Chovy flasher has been very effective recently. The Glow Green Splatter Back Coho Killer has been a very effective out at the Constance Bank. Halibut fishing was FAIR this past week. Dogfish this week seem to be more of a problem. Most anglers that were fishing were using mackerel, extra large herring, salmon bellies and/or octopus for bait. Berkley Gulp and Powerbait soft plastics also work very well. You can also use a large spoon fished off a spreader bar, Mudraker or Lucky Jigs or other large Jigs if you want to stay away from the dogfish. The salmon conservation measures that were put in place due to low flows and high water temperature have been rescinded. This notice re-opens the 2015 river opportunities in Regions 1-1 to 1-13 with the exception of the Cowichan River. The Cowichan River remains closed at this time. Trout fishing was GOOD on most lakes in the South Island area this past week. Bank anglers are catching trout on Powerbait, Gulp Eggs, or worms while fishing from shore and right on the bottom. Orange Garlic and Pink Garlic have been good choices recently for Powerbait. Fly anglers are fishing Pumpkinheads, Wooly Buggers, Leeches and Micro Leech patterns on full sink fly lines. Trollers have been doing well with Gibbs Gang Trolls and Gibbs Wedding Bands. Other good trolling lures are the Apex Trout Killers in rainbow, green or black and white patterns. Flatfish and/or Kwikfish have also been effective in sizes 5 to 7 in Frog, Black with Silver Flake or Rainbow Pattern. Bass fishing is FAIR. Soft plastics rigged Carolina style are working well and crank baits too. Soft plastics rigged “Carolina Style “is also a good choice when fishing drop offs and docks. The most productive colors in 4” Yum baits are Smoke or Pumpkinseed. Langford Lake, Shawnigan Lake, Prospect Lake and Elk and Beaver Lakes are the best local bass lakes. St. Mary’s Lake on Salt Spring Island is also a great lake for bass fishing. The Oregon Department of Fish and Wildlife (ODFW) reports that fall Chinook are available in tidewater in increasing numbers and that some hatchery coho are making their way through tidewater and into the lower river. Occasional summer steelhead are still being caught. Fishing for cutthroat trout is fair to good. The hatchery hole area is closed to all fishing through Oct. 15. In addition, the Dam Hole (near MP 7 on Trask River Road) is closed through November.